The goal of transit-oriented development is to vastly reduce the need for driving by using train stations to create “urban villages.” Many also include protected bike lanes and easy connections to bus routes. 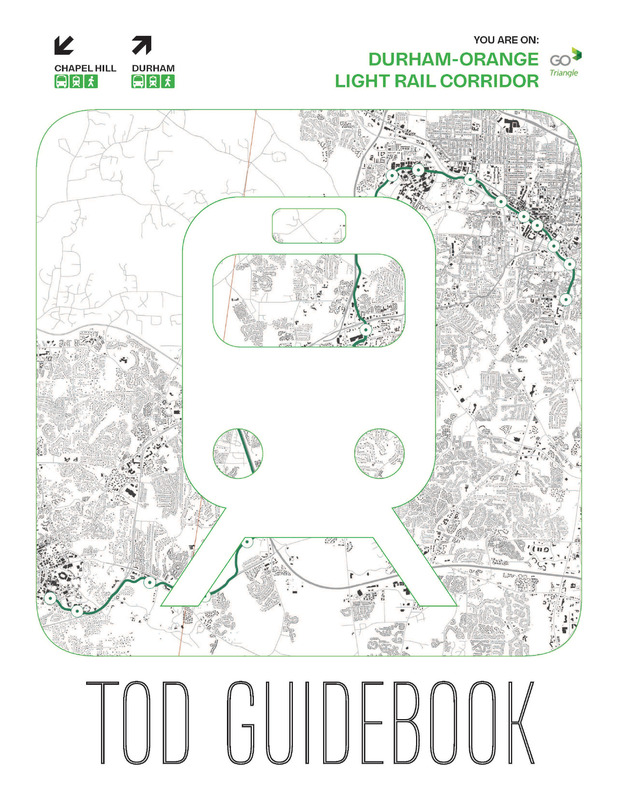 The guidebook’s blueprint provides one possible future among thousands of potential scenarios to best capture the opportunity the light rail brings to guide growth, expand access to opportunity, increase jobs and generate tax revenue that allows the region to invest in other goals. Here is a look at what each scenario would bring to the community. As the main station serving UNC Hospitals and much of the University of North Carolina-Chapel Hill campus, it has the highest projected light-rail ridership. Connectivity is the primary focus. This station sits on the southern edge of the University of North Carolina at Chapel Hill near athletics facilities. Peak demands will align with special events such as basketball games and football games. The station also provides additional connectivity to the rest of campus via pedestrian, bike and frequent bus access. This station serves recently constructed and approved mixed-use redevelopment along NC 54, including East 54 and Glen Lennox. Friday Center provides an opportunity to reinvent the Friday Center while adding opportunities. for new buildings for the University of North Carolina at Chapel Hill, as envisioned in its Campus Master Plan. Woodmont is ripe for mixed-use development opportunity. Existing development is suburban, but a few key parcels are undeveloped, offering an opportunity to create a mixed-use neighborhood destination with a variety of housing types transitioning to the nearby garden apartments, condominium complexes and single-family neighborhoods. Leigh Village provides an opportunity to create a substantial urban village well-positioned within the existing suburban fabric between Chapel Hill and Durham. Gateway capitalizes on an important regional location ideally situated for redevelopment that includes a large employment and mixed-use suburban center and for reinventing Eastowne within the station area. Patterson Place capitalizes on opportunities for transformation of the existing shopping center into a conveniently located and walkable suburban center with a range of employment, housing and commercial uses. This station will unlock the transformative potential for an aging suburban area with possibilities for strengthening connections to nearby residential areas. Its existing infrastructure and large parcels support a transformation of low-density, single-story suburban retail to transit-oriented development. It would serve some newer urban development constructed along Erwin Road while increasing access to a range of multifamily homes to the west and Duke University’s main academic campus to the east. It serves the major employment and medical destinations of Duke University Medical Center and VA Hospital. It serves a historic and evolving mixed-use neighborhood center west of downtown Durham and provides access to neighborhoods to the north and potential redevelopment of Duke’s Central Campus. It provides access to Durham’s historic West End and its reinvigorated commercial district, plus historic neighborhoods to the north and south as well as Duke’s Smith Warehouse and East Campus. They serve central downtown, with one at the Durham Transportation Station providing GoDurham and GoTriangle bus connections and the other at the main north/south pedestrian spine and core of the downtown Durham business district. This is the last station north of NC 147 serving neighborhoods to the north and east of downtown, and it also provides park and ride access from Alston Avenue and NC 147. It serves the third major university on the line as well as nearby residential neighborhoods. *If the strategies in the book were implemented, Durham and Orange counties could realistically expect $3.3 billion to $4.5 billion in extra property value, $1.4 billion to $1.9 billion in new tax revenue and 46,300 new jobs within the rail corridor through 2057.